Like bringing a carbon fiber howitzer to a knife fight, the Transition Sentinel Carbon X01 Complete Mountain Bike decimates trails. Starting at the back, the Sentinel has wide and rigid Boost-148 spacing paired to 140mm's of RockShox goodness along with refined Giddyup 2.OHHH suspension. Combine that with the Fox 36's plush GRIP damper spearheading and you've got a toolkit to craft your own good times. 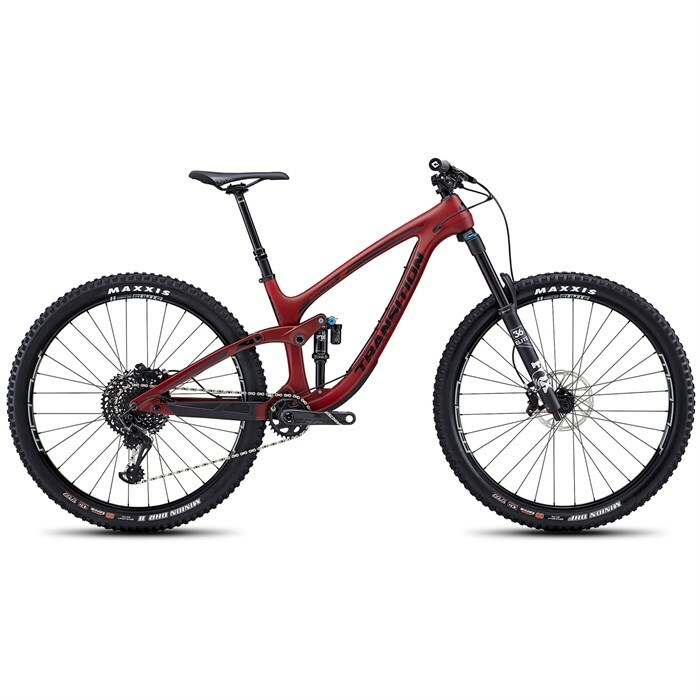 Finley tuned like a superstar's guitar, the Transition Sentinel Carbon X01 Complete Mountain Bike features a tailored Speed Balanced design that harnesses every pedal stroke of its 29" wheels and legendary SRAM 12-speed drivetrain. All this creates a rowdy ride that's sure to draw out anyone's inner mullet - whether it's long days of up and down or adventuring down steep and loamy descents. Fox DPX2 Performance Elite Shock  Combining DPS XC efficiency and X2 DH performance, the DPX2 is the ultimate trail shock. The Dual Piston Base Valve has dedicated compression and lockout circuits for each of the three modes -- Open, Medium, and Firm. It also features a recirculating damper design found in X2 shocks, creating excellent small bump sensitivity, great mid-stroke damping support, and better control in transitions. 160mm Fox 36 Grip2 Performance Elite  The award-winning 36 gets a huge performance boost with Fox's new FIT GRIP2 4-way adjustable damper. Equipped with a patent-pending Variable Valve Control (VVC) high- and low-speed rebound adjuster, improved compression damping, and less friction overall, the new 36 offers a new level of performance and adjustability. SRAM Descendent Carbon DUB Crankset  The svelte strength of carbon fiber with the swagger of heavy metal. The Descendant carbon crankset uses a proprietary TRUVATIV carbon construction process that delivers a 170mm crankset light enough for XC, yet bold and badass enough for Enduro. It has 32 X-SYNC™ teeth, fully compatible with all Eagle drivetrain components. X01 Eagle™ Rear Derailleur  This derailleur not only answers the Eagle™ drivetrain’s need for greater capacity, but it’s also the next evolution of the proven, 1x-specific X-HORIZON™ design. The larger, 14-tooth X-SYNC™ lower pulley allows 10- to 50-tooth cassette capacity in this relatively compact design, and also adds to Eagle’s overall smooth-pedaling feel. X01 Eagle™ Trigger Shifter  Tucked neatly beneath your handlebars, the X01 Eagle™ X-ACTUATION™ trigger shifter is the nerve center of the Eagle™ drivetrain. Its internal works have been updated to include a 12th gear, and improved to enhance trigger feel, precision and durability. SRAM Code RSC Brakeset  Code RSC is built from the elements that made Guide a benchmark in contemporary brake design and performance, and delivers an extra 15% power to shine in all heavy duty applications. SwingLink™ and Lever Pivot Bearings ensure a smooth and progressive feel at the lever, while the additional 30% positive fluid volume ensures consistent performance even when braking harder, more frequently or with a heavier mass to slow down. You can't go wrong with four pistons of stopping power. Stan's Flow MK3 Team  Stan's Flow rims have had a long history as the go-to trail and all-mountain wheelset for riders around the world, and the Flow MK3 continues the evolution. Stan's Flow MK3 wheels have claimed victories in both World Cup DH and Enduro World Series races, while still being light enough for all-day trail rides. Stan's patented tubeless bead socket technology offers the easiest and most secure tubeless setup in the business. The patented low-profile shape of the rim also resists pinch flats and reduces overall rim weight. The Flow MK3's 29mm WideRight internal rim width provides the perfect balance of tire stability and traction. Laterally stiffer and more durable, the Flow MK3's 6069 alloy is also lighter and stronger than conventional 6061 alloy. Born and bred for control at speed and perfect for technical trails, Stan's Flow MK3 in a class by itself for trail and all-mountain performance. Maxxis DHR II Rear Tire  With side knobs borrowed from the legendary Minion DHF, but widened to provide more support, the DHR II corners like no other. The center tread features ramped leading edges to improve acceleration and sipes to create a smooth transition when leaning the bike. Paddle-like knobs on the center tread dig in under hard braking and help keep the bike under control. Pair it with a Minion DHF up front for the ultimate aggressive trail riding tire combo! The Minion DHF is available in trail, enduro, and downhill specs.